Welp. I got a little bit behind on my reading. I read something like 9 books this summer and I was blasting through them, one after another. Then I got to Middlesex. And it felt like it took me a hundred years to get through it. I felt like I was back in high school and I was reading my summer reading and I was dreading the time I was spending with this book, but I was too stubborn to call it off. I have a strict one-book-at-a-time (well, one book-book and one audio-book at a time) rule so I don't get all stressed out, so that one book kept me from reading anything else until I finished it. Anyhoo. I finally finished that monster, and I also just finished rereading a classic from my sophomore year of high school (which was lovely). 99% of the reason I'm on Goodreads is the fact that I like seeing my progress on that chart. It's like the same thing that keeps me working out--I like to see my mileage for the week. All of the sudden I'm 11 again and I'm trying to be the kid on the wall at the library who reads the most books in the summer reading program. I have to say, also, that getting my MFA is good motivation to read, but I'm so in the habit now of reading like a madwoman that I'm quarters ahead of myself. I actually made myself download something just for fun this time, so we'll see how much literary value it has when I get a little further into it. Okay, okay. Before I get into this review, let me tell you that I already know two things. 1) Everybody and their mom loved this book. 2) Me not liking this book feels like admitting that I am a less serious literary person. That second part hurts me inside, but I have to be who I am. I actually feel kind of bad for recommending this book to one of my students last year because I had heard it was good. Oh well. Thanks a lot, Oprah. I just didn't like this book. Literary people be damned, it just wasn't my cup of personal tea. Not my jam. Not my brand of size 8 long Express jeans. I suppose there was a point about 400 pages in (to the 544 pages--not that I was counting every dreaded one) where I was like, okay, I don't hate this book. It's kind of interesting. But that faded and by the end I was back to just not caring about anyone or anything that happened. I think my problem started off being a stylistic one. The book shifts between very slow exposition about the main character, Calliope, and a very long and drawn-out flashback about her grandparents. All of that is fine, but the shifts didn't feel natural, like something was unbalanced about it to me. It took forever for the main story to get going. It felt like I got caught up too much in the grandparents' story and that was a distraction rather than it illuminating something wonderful about the main character. 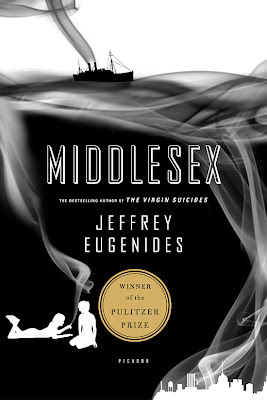 By the time Eugenides got around to the main character's story (at least, the bulk of it), I just wasn't invested. For the rest of the book I just felt like the characters were too distant and I didn't find myself caring enough. There was also a digression near the end that felt unresolved and kind of pointless--and again it felt out of balance to me. I will say that I think (and this was pointed out to me by one of my fellow MFA-ers when I posted about it on Facebook) that a lot of the buzz about this book had to do with its subject matter--gender identity--which was (maybe?) not something as prevalently discussed in 2007 as it is now. I know that seems like a teeny distinction of time and the world is not a new place, but I didn't find it shocking or unusual enough to say that the subject matter made up for the frustrations I had about the way it was written. I'm also sure that the stylistic things about it that I didn't like were just personal preference. It wasn't a bad book at all, but it just wasn't my kind of book. My recommendation: You might want to read it if you're curious about gender identity or the way we characterize men and women in fiction. But if you do, just know that it's very long and very dry, especially for the first 300 pages or so. But I can't really say everyone I know should read it. This book was something I read as a sophomore in high school, and I remembered liking it but I didn't remember much about it. It was kind of an interesting thing to go back and read it again--in fact, I was listening to it as I walked the park this past month or so. 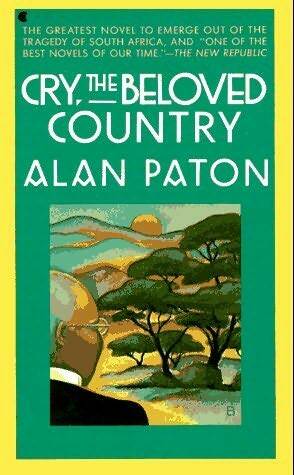 It was written by a South African author and came out in 1948--just before the start of apartheid in South Africa. It's interesting for two reasons: first, because it shows the conditions just before apartheid from an almost unbiased perspective, and second because it is written in a style that echoes that of the King James Bible. I liked it again this time, but listening to it again taught me a lot about my own writing style and what I like in my fiction now (as opposed to when I was fifteen). It has a euphonic, almost musical quality to it. The repetition of phrases made it really soothing listening. But it is written in a very distant third person perspective, and my connection to these characters was not as close as I would have liked, now. But I think in the context of the story it works because it's like reading a legend. It reads (and listens) like a story that would be passed down from generation to generation, and I think that for this kind of journey/reunification story that's the kind of thing that works. My recommendation: A good read or listen. This one's a classic for a reason.